I’ve decided to take a trip back in time. This time last year I was in the middle of an undertaking to start planning the long term care of the Willy de Majo archive. Up to that point, some the materials were kept in our external store, making this rich collection inaccessible for researchers. Because the materials had been stored externally, they could not be brought back to us here at Grand Parade without going through a strict quarantine process in order to prevent any contamination issues. Since we don’t have those facilities here, this project was a natural continuation of our collaboration with the conservation department at The Keep, after we had finished with James Gardner’s plans. 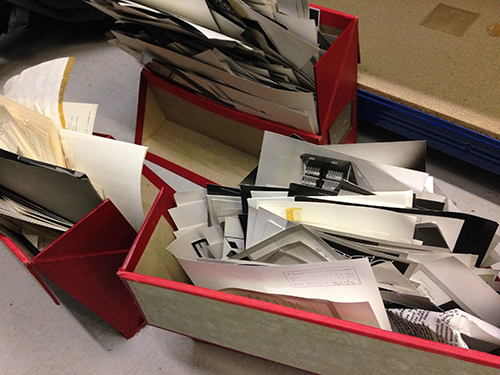 I thought the process of sorting and cataloguing a large collection of duplicate materials would make an interesting three-or-four -part blog post. Being able to show and talk about a collection of materials and the journey it takes from its original state to one which is more structured and clear for researchers is something that forces us to take an overview. Conserving individual items in collections requires me to look at the detail this was a fantastic opportunity to gain an understanding of a larger picture and I have (secretly) loved the process – well, most of the time anyway! 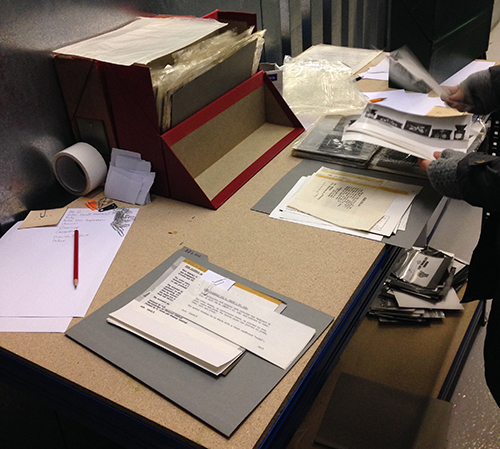 The project gave me a chance to work in close collaboration and pick the brains of our Archivist Sue Breakell. It has been a great learning curve for me by being an eye-opener into ‘the other side’ of archives – seeing them as entities instead of as individual items. 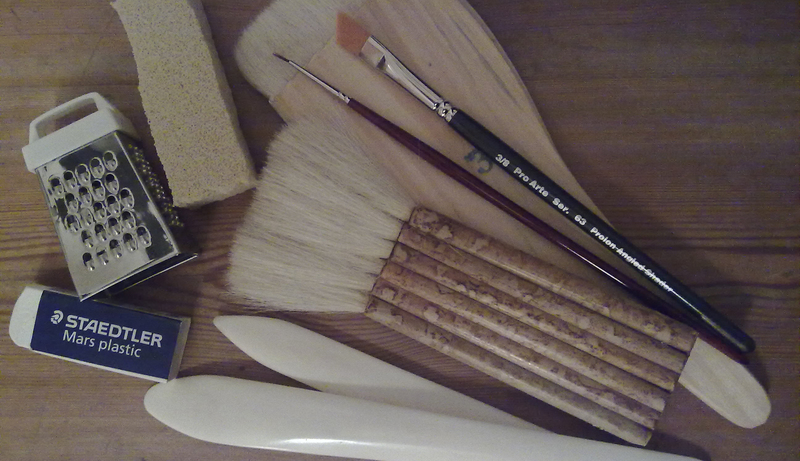 So… I am going to start the story with a Part I of this blog ‘series’! In the beginning, there was the order in which things were placed by Mr de Majo himself in, what I believe to have been his London office. I found two colour photographs (below) amongst his archive as I was sorting through it, and couldn’t help scanning them right away! The archive was transferred to us in 2009 by the de Majo family after our Curatorial Director Catherine Moriarty had worked in collaboration with them for some time. 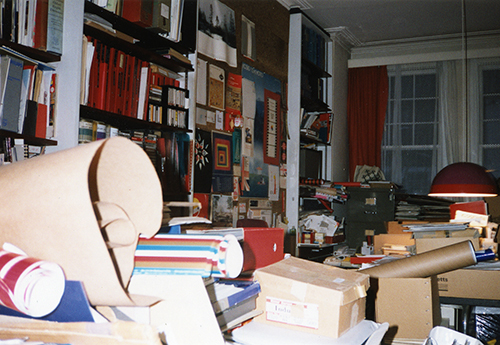 It comprises Willy de Majo’s work with design organisations (for example, he was the founder of ICOGRADA), design materials and related papers, as well as photographs, in connection with his various clients. The materials date from the late 1930s all the way up to the early 1990s. The process of getting the materials in store in an order which made some kind of sense meant Catherine Moriarty, Sue Breakell and I spent several days in our external store to begin the process of getting the materials ready for the next step of taking them through the quarantine process. This started with a plan for disposal of duplicate materials. Willy de Majo was a man of meticulous record keeping which often meant he kept multiple copies of everything. Even though work with the de Majo family had identified extensive duplication and material for disposal, this next step required further sorting – the decision was made that we were to keep three copies of items we had various copies of. And so it began! Above you can see the way in which the archive was housed for some time. 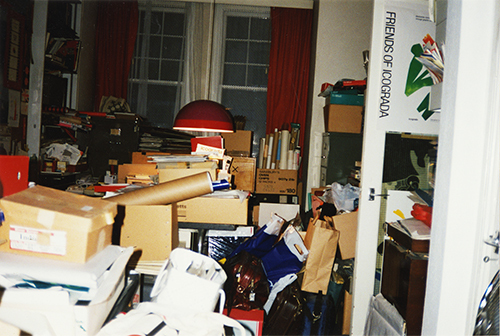 Items were kept in various boxes but they were in no particular order. 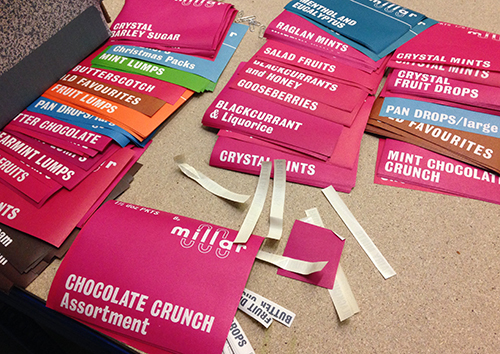 The volume of the materials felt overwhelming at first glance, but we soon adopted a mind-set of ‘one box at a time’. I know archivists go through these emotions all the time, but bear with me! The process ended up being very satisfying to go through once I had personally gotten over the nervousness about throwing items away, repeating the mantra of ‘we have multiples, we have multiples’ as I went through. We marked for disposal through confidential waste whole stacks of duplicate materials and the load started to slowly but surely feel lighter and much more manageable. Below is a good example of the extent to which the materials were duplicated. These labels were also found in several locations within various boxes of miscellaneous materials, which made the process of matching and making sure you had enough of everything very, very complex at times – especially with limited space to spread things out in. 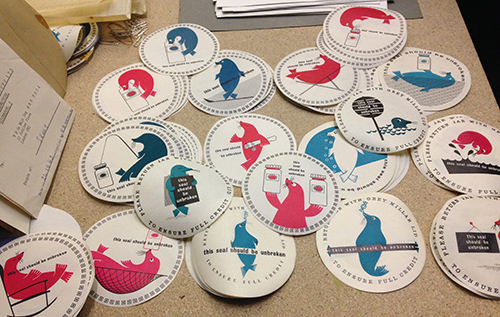 My absolute favourite things from the process were the Millar jar seals (below). There were several designs and the text on all of them reads ‘This seal should be unbroken’. Genius. The collection also has various photographic formats within it. Some of these were in the form of 35mm colour slides stored in slide ‘canisters’, others black and white photographic prints in various files and folders. 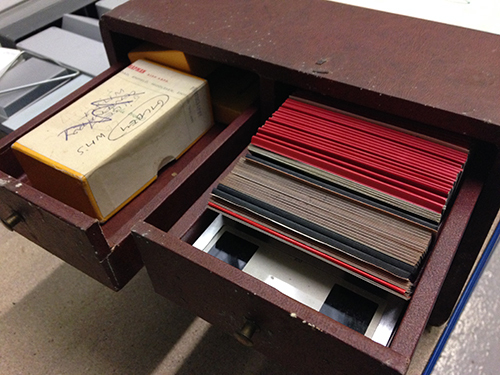 We also had this mini chest of drawers (below), which housed boxes of loose slides and hundreds of stereo slides. Obviously this kind of housing for photographic materials is not ideal, so the chest of drawers had to be disposed of while the slides were organised in their original groupings and boxed separately, ready for the next stage. It was fantastic to be given the opportunity to go through this initial process with Sue. It was fascinating to already note at this stage how differently we can view things: Sue looks at the content of the materials, reading pieces of paper while sorting, when I have been wired to mainly focus on their condition. Opening my mind to an archivists’ way of seeing has been massively valued and helped me immensely as I continued with the project. To be continued… Look out for Part II coming soon.